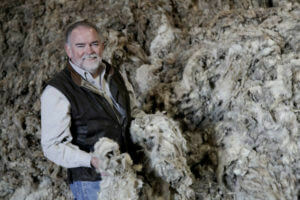 Michael T. “Terry” Martin stands in front of a mound of freshly shorn fleece or “grease wool” in the Anodyne warehouse. The wool will be washed, picked and combed. It was 10 a.m. and Michael T. “Terry” Martin (B.B.A. ’81), president of Anodyne Wool, was on his way to the hardware store to pick up supplies. Freezing temperatures in San Angelo the night before had damaged a pipe in the warehouse. While most business owners would call a handyman, Martin is the hands-on type, especially when it comes to running a multimillion-dollar, family-owned wool empire. Anodyne is the sole supplier of wool for the U.S. Department of Defense. Whenever you see a service member in a formal wool or wool-blend dress uniform, you’re looking at wool sourced by Anodyne. Growing up in San Angelo, Martin worked as a day laborer on sheep ranches, but he never thought about going into the industry. It was more likely he would end up a lawyer, like one of his brothers, or go into the wholesale liquor business with other family members. After graduating from high school, Martin thought he might attend Angelo State University, where his girlfriend (and future wife), Jackie, and several high school friends were enrolled. However, his parents had other plans. They were major advocates of higher education and put all eight of their children through college. They also valued an education away from San Angelo. So unbeknownst to Martin, St. Mary’s University would become his new home-away-from-home. Martin’s father had a friend in San Antonio he had met through the Serra Club, an organization of lay Catholics to foster vocations to the priesthood, who he wanted to visit and introduce to his son. Agreeing to the trip, Martin packed a bag and drove to San Antonio with his father to meet the Rev. James A. Young, S.M., Ph.D., then-president of St. Mary’s. After going to lunch and having a brief discussion about admission, Martin — to his surprise — was enrolled. Within just a few hours, he moved into Chaminade Hall. Residence hall life for Martin was a “cornucopia of cultures” and a stark difference from that to which he was accustomed. His peers were from diverse locations, including Mexico, Peru, Bolivia and Greece. After graduating from St. Mary’s with a business degree, Martin moved back to San Angelo and joined Anodyne Wool as a wool buyer’s apprentice. The company, founded by Martin’s father-in-law, was a commission-based wool and mohair-buying firm. Martin’s introduction to the textile industry was about to get wild and woolly. During the early 1980s, the implementation of two international trade agreements led to the industry rapidly downsizing and moving overseas. Martin, who was new to the business, saw this as an opportunity for Anodyne to export American wool. At first, exporting to a European company went well. However, after only a year, their overseas customer went belly up, and Martin needed to unload a lot of wool. “I heard through the grapevine that a delegation of Iraqi cotton buyers was traveling through Texas on a buying mission sponsored by the USDA (United States Department of Agriculture),” he said. It turns out, Martin is a dyed-in-the-wool salesman. He met with the buyers in Dallas and made the most important sale of his career, beginning a five-year trade agreement with the Iraq Ministry for Textile Industry that would triple the size of Anodyne Wool. The Iraq deal ended with the Iraqi invasion of Kuwait. Anodyne experienced a huge decline in domestic wool production during the 1990s, when many U.S. textile mills went out of business. “We survived by diversifying our client base,” said Martin, who focused on the growing export market in Europe, China and India. With grit, perseverance and a boots-on-the-ground approach, Martin found success and created a world-renowned brand. Martin became Anodyne’s president when his father-in-law retired in 2001. The company now acquires millions of pounds of wool each year from wool growers across the United States and has trade alliances in Europe, Russia, Australia, South Africa and South America.